Lygus bug (Lygus hesperus) (Fig. 1) is a major pest of strawberry in the Central Coast. 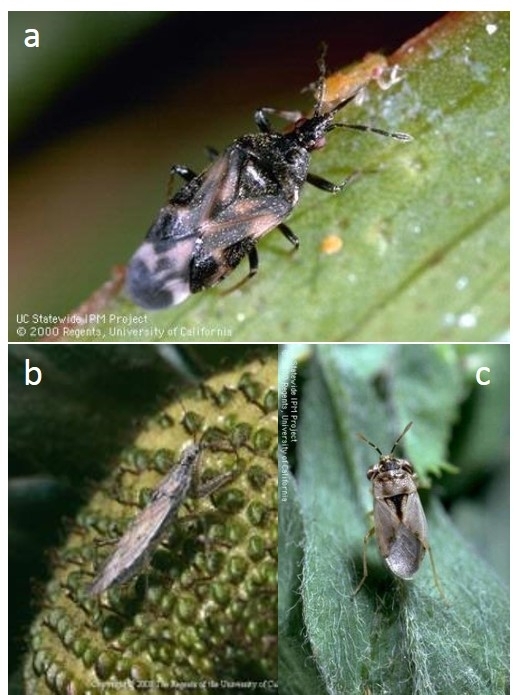 Lygus bug populations develop on weed hosts surrounding the strawberry fields such as wild radish, common groundsel, lupines, and mustards (Zalom et al. 2012). Time to time, adults migrate into the strawberry fields and lay eggs. Eggs hatch, and molt through five nymphal stages before molting into adults. Lygus bug feeding on the developing embryos affects the normal development of tissues surrounding the embryo (Handley and Pollard 1993) and affected fruits are misshapen often referred as “catfaced fruit” (Fig. 2) which are deemed unmarketable. Although both nymphs and adults can cause catface injury, nymphs are considered more destructive than adults. The young fruits up to ~10 days after petal fall are considered vulnerable to economic injury from lygus bug feeding (Zalom et al. 2012). Chemical control continues to be an effective tool for lygus bug control and growers are always seeking effective and softer insecticides for its control. A replicated trial comparing the efficacy of insecticide treatments against lygus bug was conducted in first-year strawberry ‘San Andreas' in Watsonville, CA in 2016. The details on insecticide products and rates used in the trial are shown in Table 1. The insecticides were applied twice at 10 day interval using commercial tractor mounted sprayer. The water volume used for both the applications was 150 gal per acre and was applied at 140 psi. Dyne-Amic (surfactant) was added at 0.25% v/v to all the treatments. Insect samples were collected using regular sized Rubbermaid container by hitting 20 flowering strawberry plants with lid. In addition, 60 fruits were sampled from each plot to determine catface injury. 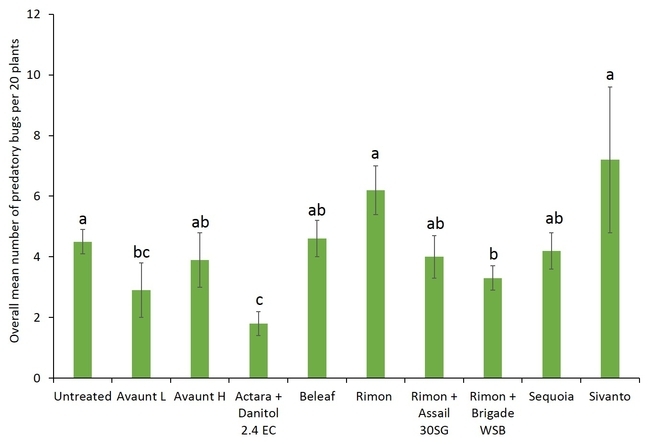 Pre-count sample did not show any difference in number of adult and nymphal lygus bugs among treatments (Figs. 3 and 4). Overall, all the insecticide treatments reduced the number of lygus bug adults and nymphs compared with untreated plants. The combination treatments using pyrethroid insecticides such as Danitol and Brigade suppressed lygus bugs and general predators such as bigeyed bug, minute pirate bug, and damsel bug as well as spiders (Figs. 5-8). 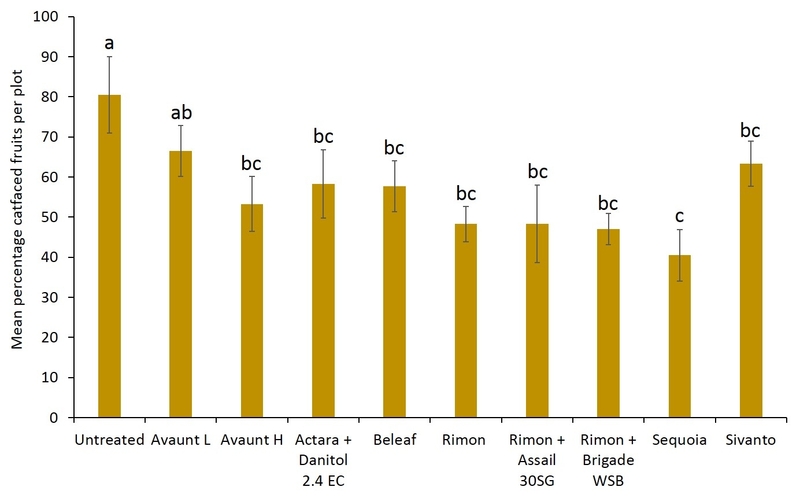 Data show that reduced-risk insecticides, Rimon and Beleaf suppressed lygus bug nymphs as well. Sequoia, not yet registered on strawberry, provided a decent lygus bug control. Sivanto initially provided a good suppression of adults and nymphs but could not adequately sustain the control for more than a week. Two rates of Avaunt (unregistered insecticide on strawberry) was included in this experiment and were comparable to other effective insecticides in this experiment. Insecticide use certainly reduced catface injury on strawberry fruit. 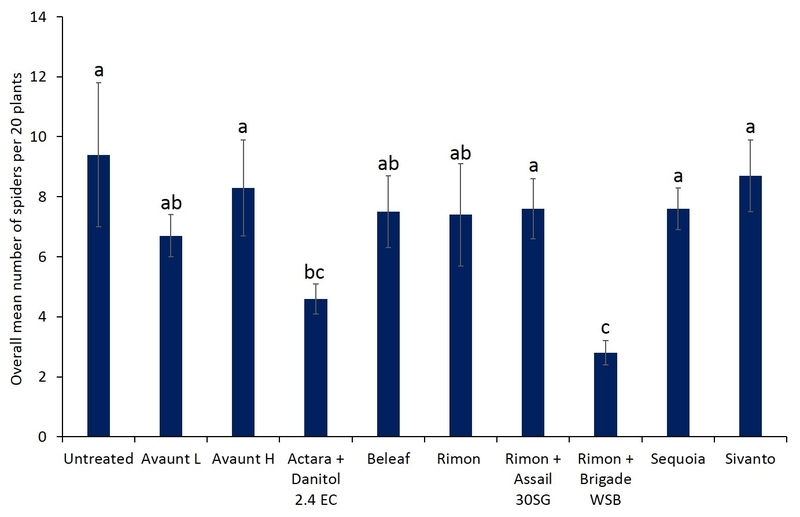 Number of fruits with catface injury was lower in all the insecticide treated plants than untreated except the lower rate of Avaunt (Fig. 9). 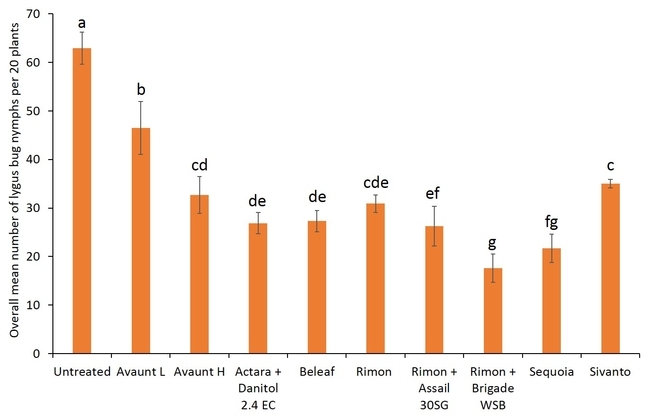 Catface injury on fruits treated with Sequoia was lower than untreated but not different from other insecticides (except lower rate of Avaunt). Handley, D. T., and J. E. Pollard. 1993. 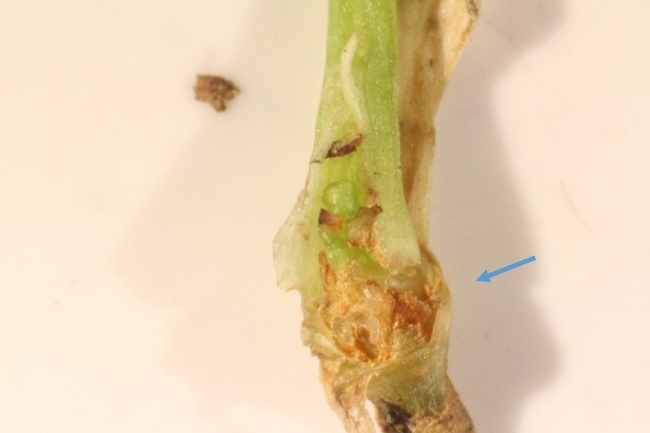 Microscopic examination of tarnished plant bug (Heteroptera: Miridae) feeding damage to strawberry. J. Econ. Entomol. 86: 505-510. Fig. 1. Lygus bug adult. Fig. 2. Catfaced or misshapen fruit due to lygus bug feeding. Table 1. 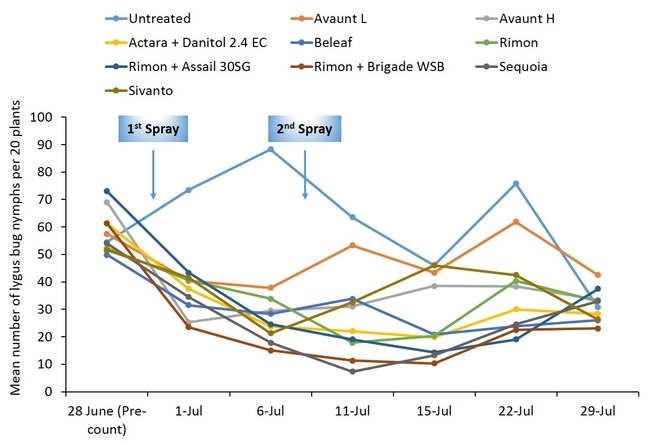 Insecticide treatments tested in this trial. Fig. 4. Mean number of lygus bug nymphs collected by week from the treated plants. Fig. 5. Overall mean number of lygus bug adults collected from the treated plants. Fig. 6. Overall mean of lygus bug nymphs collected from the treated plants. Fig. 7. 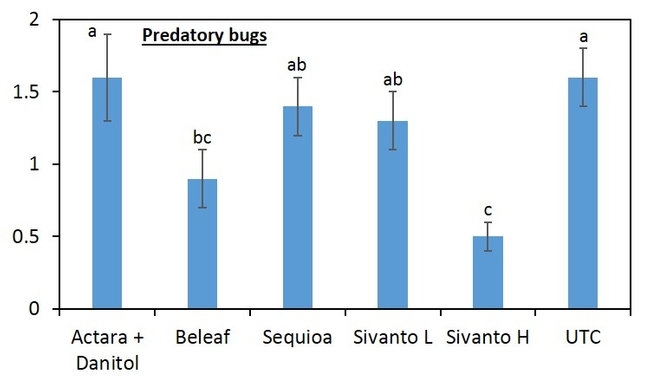 Overall mean of predatory bugs collected from the treated plants. Fig. 8. Overall mean of spiders collected from the treated plants. Fig. 9. 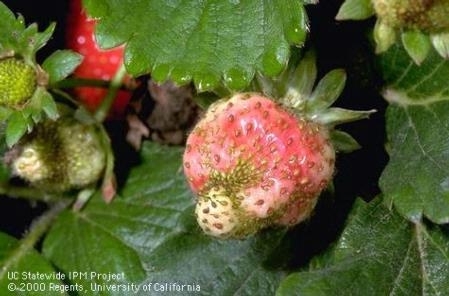 Percentage strawberry fruits with catface (lygus bug feeding) injury. 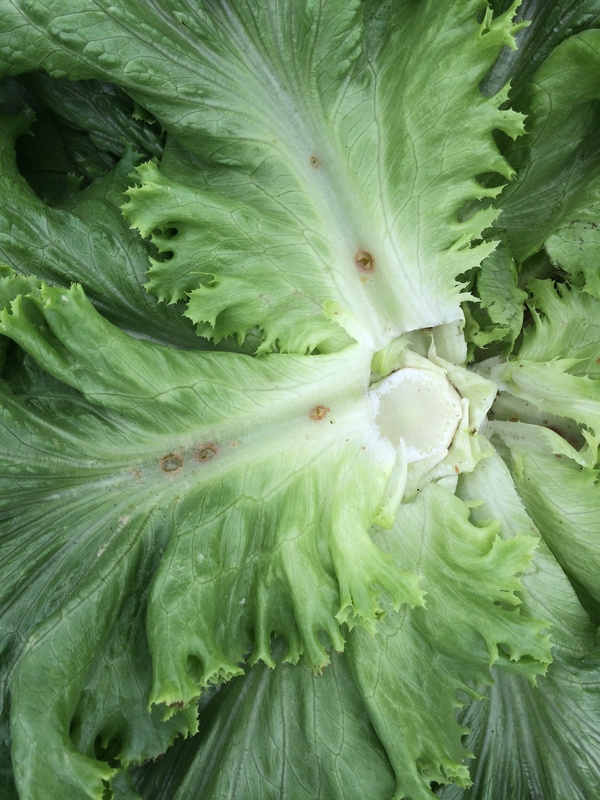 The western tarnished plant bug or commonly referred as lygus bug (Lygus hesperus) has emerged as a serious pest of celery in the Central Coast. The mouthparts of lygus bug, often referred as piercing-sucking, consists of four stylets. Lygus bug uses these stylets to probe host plants and feeds on the plant fluids. When lygus bug feeds, it inserts the stylets into the injured site. Once stylets are inserted, they pre-orally digest the meristematic tissue and the slurry of digested tissue is ingested. 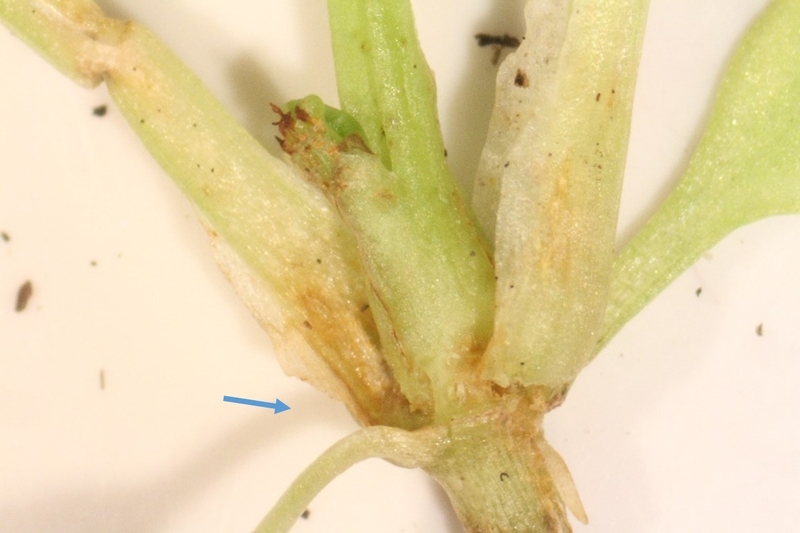 Injury caused by lygus bug on celery seedlings and mature plants is not completely understood. Red to brown elongated lesions are suspected as to be lygus bug feeding injuries on both young seedlings and mature plants. Also, in the greenhouse, celery seedlings suffer severe stunting or poor plant growth which is often suspected to be attributed to lygus bug feeding injury. Thus, a study was conducted in 2015 to confirm injury caused by lygus bug. In Central Coast, lygus bug develops on weed hosts such as wild radish,common groundsel,lupines , milk thistle and mustards (Brassica spp.) surrounding the production fields, ditches, and roadways (Zalom et al. 2012). As weed hosts senesce, lygus bug adults tend to leave them, seeking food, water and shelter elsewhere including seedlings in greenhouses and mature plants in fields. 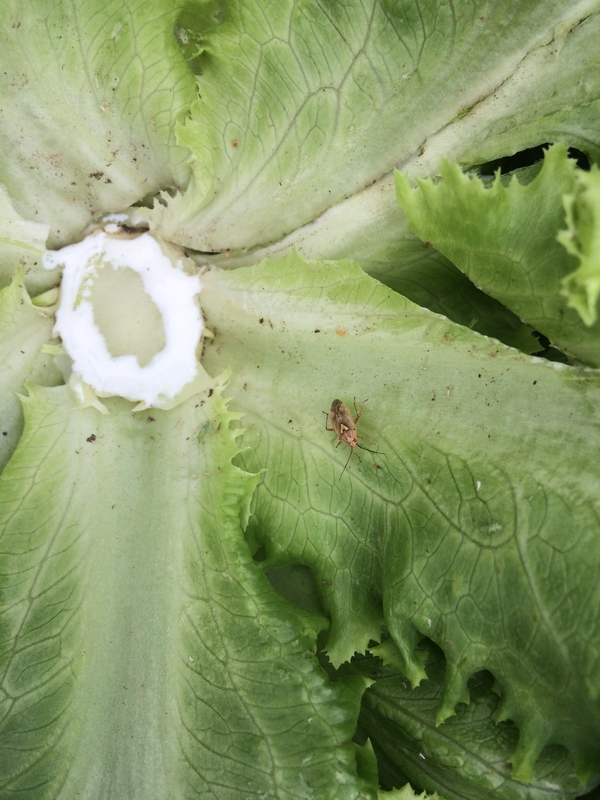 The invading female lygus bug settle on celery plants to feed and lay eggs. A lygus bug female lay 161 eggs (mean) at 80 F (Mueller and Stern 1973). 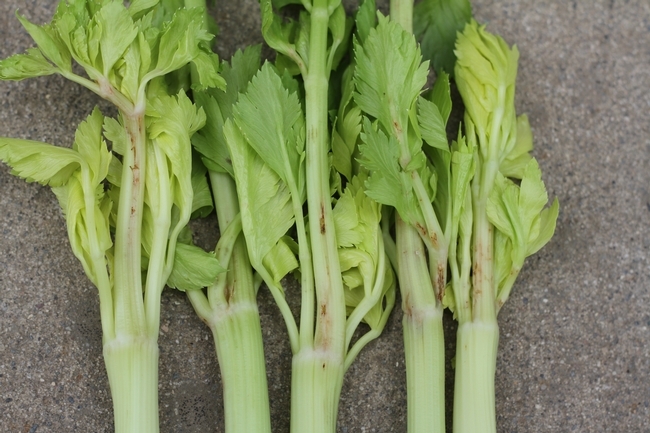 Lygus bugs on celery are primarily managed using pyrethroid (such as permethrin or zeta-cypermethrin) and carbamate (methomyl or oxamyl) insecticides. Thus, proper early diagnosis of lygus bug feeding injury is critical in determining the need of insecticide use and application timing for its control. 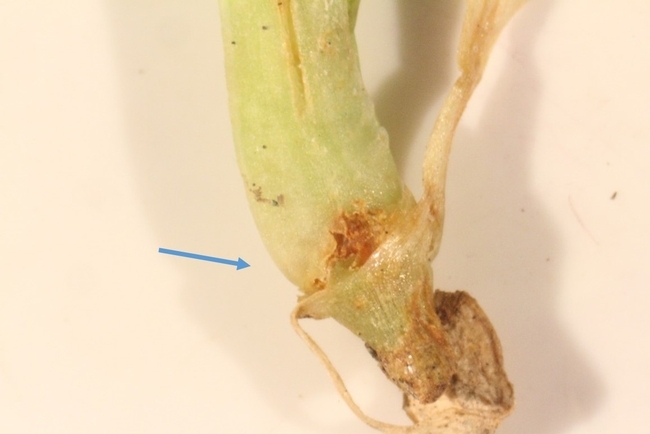 The two major injury types noticed with lygus bug adult exposure to celery seedlings were dead necrotic tissues at the crown region (Figs. 1-4) and dead elongated lesions on the petiole (Figs. 5-8). 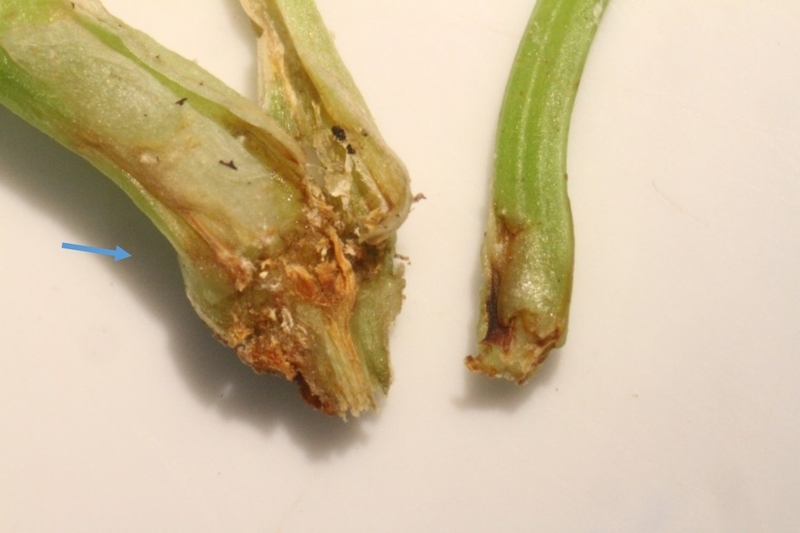 Lygus bug feeding injury as dead necrotic tissue was found at the crown area of the celery seedling. Research show that the incidence of injury in the crown area increases with the number of lygus bug adults and longer intervals of exposure (~7 days). If lygus bug invade celery plants in the greenhouse and remain for more than a day, extensive feeding injury at the crown area can be detected. Possibly, they use the cracks and crevices in the soil to hide and move from the soil directly to feed at the crown area. 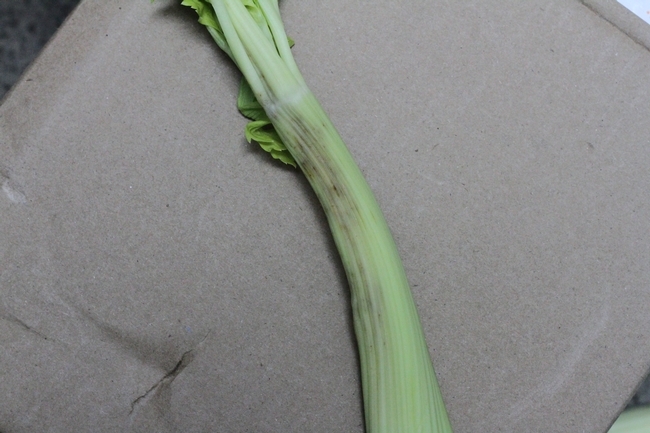 Another type of injury found on the celery is elongated lesions on the petiole (less than 0.5 inch). It is likely that elongated lesions are related to lygus bug egg laying. When a female lygus bug initiates egg laying on petiole, it lays most of the eggs in aggregated manner on a given site rather than moving around and depositing eggs singly at various sites on the petiole. 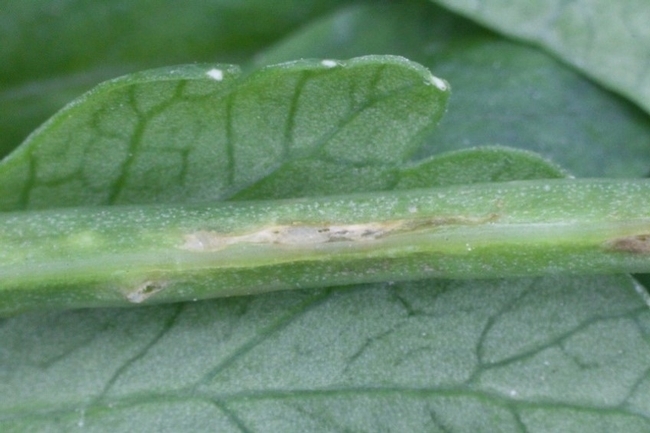 This egg laying pattern is further contributing to development of elongated lesion on petiole. Moreover, there were more elongated lesions when higher number of adults were exposed for a shorter interval (< 12 h). 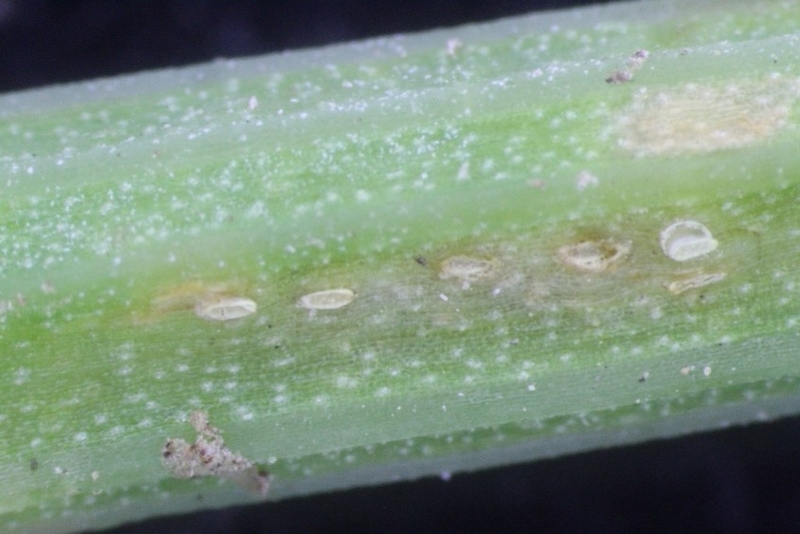 If females move into the greenhouse or field, they can quickly lay eggs and trigger elongated lesions on the celery petiole. 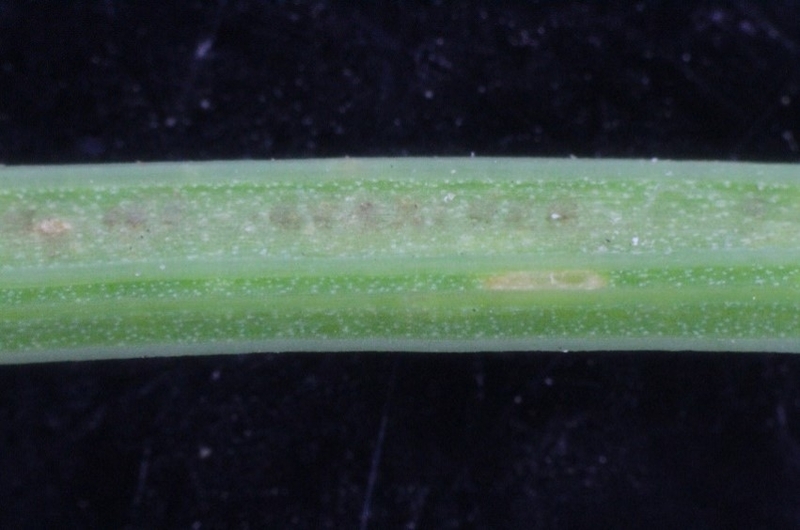 Thus, egg laying on petioles can develop into elongated lesions. Monitoring greenhouse or field is critical to reduce establishment of lygus bug population for a timely management. Feeding injury can develop if the plants are not managed after detection of incoming adults in the greenhouse. Growers often see a lot of lygus bug nymphs which suggest that adults already moved in and laid eggs. Mueller, A. J., and Stern, V. M. 1973. Effects of temperature on the reproductive rate, maturation, longevity, and survival of Lygus hesperus and L. elisus (Hemiptera: Miridae). Ann. Entomol. Soc. Am. 66: 593-597. Zalom, F. G., M. P. Bolda, S. K. Dara, and S. Joseph 2012. 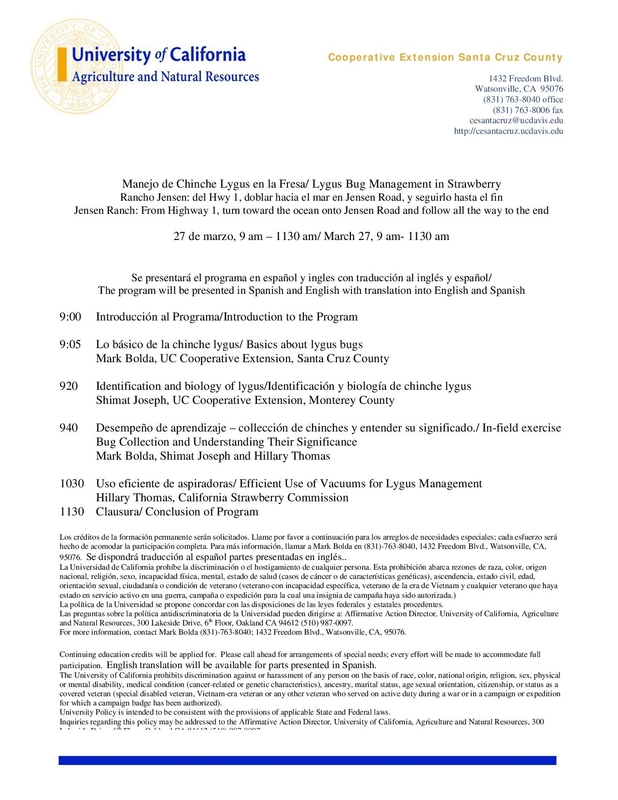 Strawberry: Lygus bug. 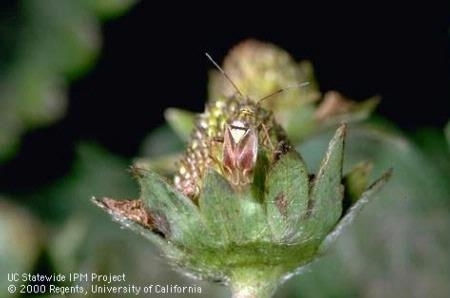 UC Pest Management Guidelines, UC ANR Publication 3468. http://www.ipm.ucdavis.edu/PMG/r734300111.html (accessed on 14 February 2016). 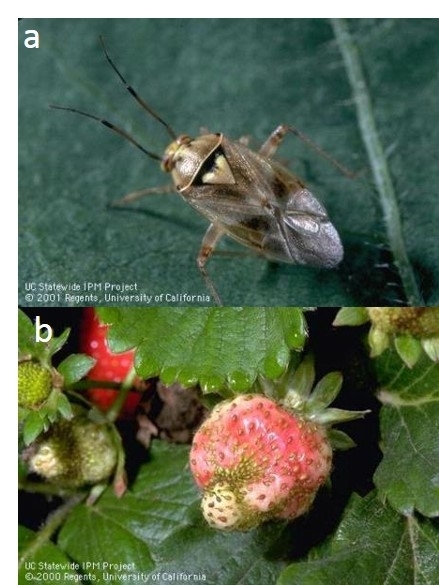 Lygus bug (Lygus herperus) (Figure 1a) continues to be a major pest of strawberry in northern Central Coast of California. The feeding injury on the young developing fruits results in catfaced fruits (Figure 1b) rendering them unmarketable. Management of lygus bug in strawberry is always been a challenge because of lack of effective insecticides with desirable attributes such as short pre-harvest intervals (PHIs). Moreover, the insecticides registered on strawberry for lygus bug control have been used over and over in the same season and it is likely that lygus bug developed resistance to those insecticides. In 2015, an insecticide trial was conducted to evaluate the efficacy of newer insecticides registered on lygus bug. 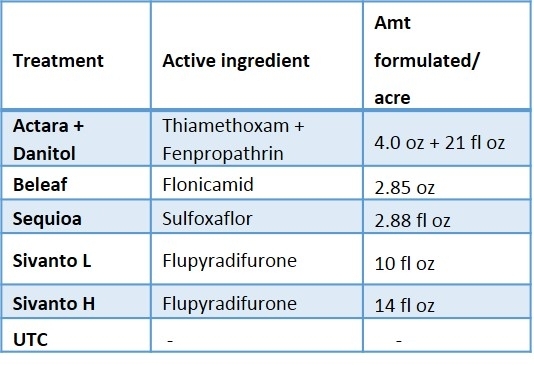 The details on insecticide products, active ingredients and rates are shown in Table 1. The newer insecticides tested were Sivanto and Sequoia. Sivanto is registered on strawberry with the maximum rate 14 fl oz per acre. Sequoia is not registered at this moment and rate tested is 2.88 fl oz per acre which is lower than 4.5 fl oz or 5.75 fl oz per acre tested in the previous years. The study was a replicated (5 replications) and the treatments were randomized. The plot size was ten 65-feet long beds which is fairly large for insecticide trial in a commercial strawberry field. First broadcast-spray application of insecticides was done on 13 June 2015 followed by a second broadcast-spray application on 20 June 2015. The insecticides were applied using commercial tractor mounted sprayer. The water volume used for both the applications was 200 gal/ acre. Dynamic (surfactant) was added at 0.25% v/v. Beat-trays were used to sample insect populations (Figure 2). Twenty strawberry plants were sampled and the sampling consists of five strikes per plant with the lid of a regular sized Rubbermaid container. Sampling was done a day before application then at 3 and 7 days after first application then 3, 7, 14, 21, and 28 days after second application. The insect samples were bagged, transported to the laboratory and stored in the freezer for later evaluation in the laboratory. 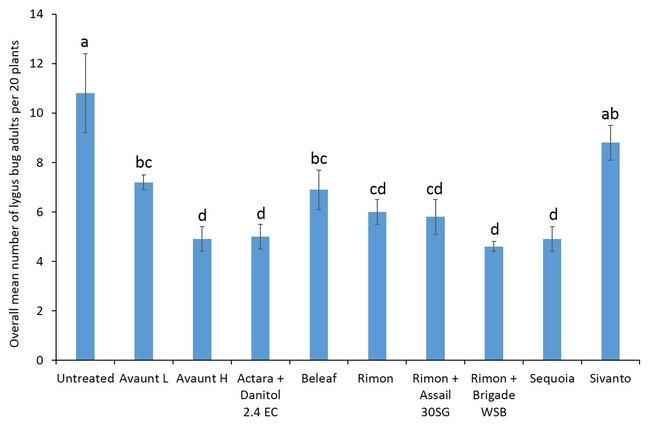 The samples were evaluated for all nymph stages and adult of lygus bug, thrips, predators (damsel bug, minute pirate bug, bigeyed bug, rove beetle, and spiders) (Figure 3) and parasitoids. 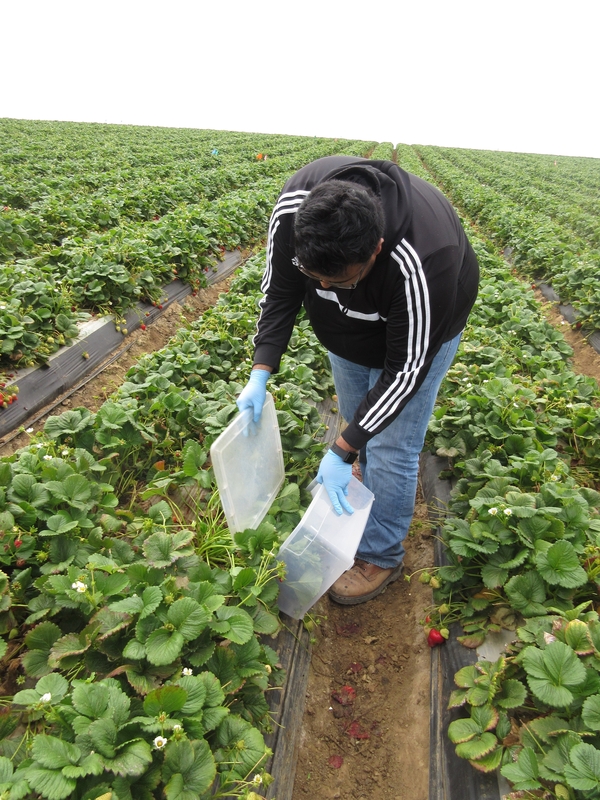 In addition, 100 fruits were randomly sampled from each plot at 28-days after second insecticide application. The fruits were evaluated for lygus bug injury or “catface” and other unmarketable symptoms such as rot, spit strawberries etc. 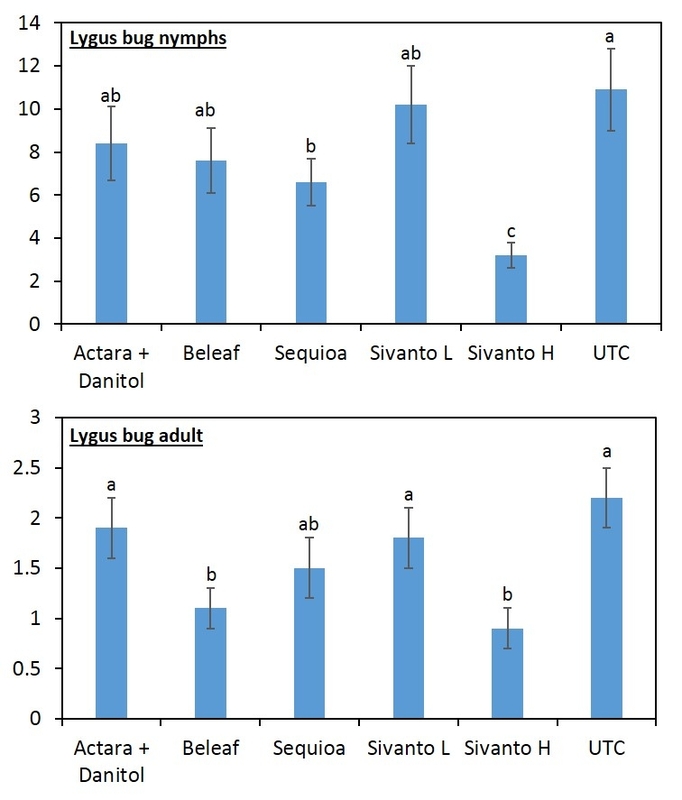 When all the data were combined, number of lygus bug nymphs were lower in the higher rate of Sivanto and Sequoia than in untreated check treatment (Figure 4). 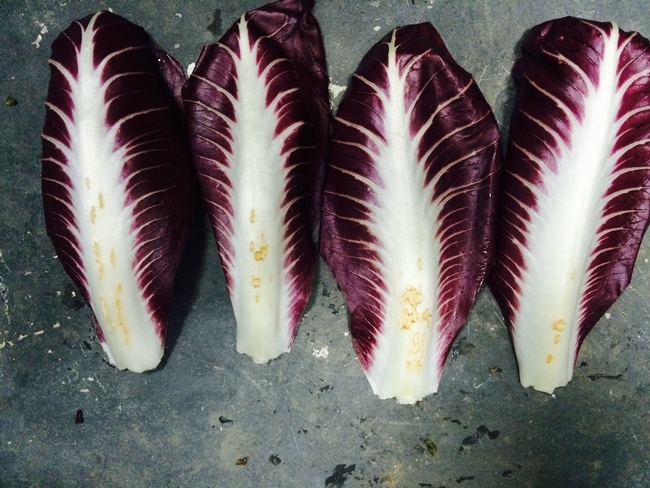 Lower number of lygus bug adult was captured in higher rate of Sivanto and Beleaf than in untreated check. Similarly, number of predatory bugs was lower in the higher rate of Sivanto than in other treatments. Spiders captured were similar among treatments (Figure 5). 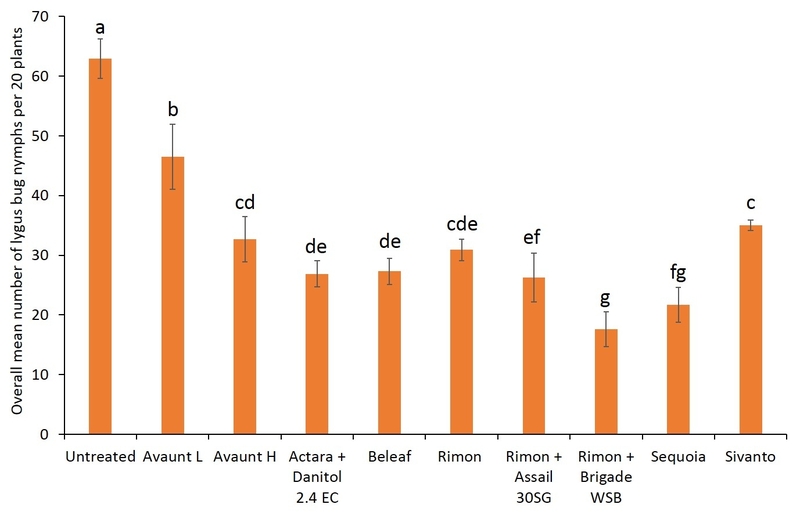 On fruit evaluation, there was no difference in number of fruits with catface injury or those marketable fruits among the insecticide treatments, although numerically, number of fruit with catface injury was lower in the higher rate of Sivanto treatment than in other treatments. Overall, it appears that Sivanto at 14 fl oz per acre performed better than other treatments against lygus bug. Sequoia and Beleaf also showed evidence of lygus bug suppression. However, Sivanto at 10 fl oz per acre did not suppress lygus bug. The representative industry standard -- combined treatment of Actara and Danitol did not show any evidence of lygus bug suppression in this study. If you are interested in reading the complete report, please click the link below. Figure 4. Lygus bug nymphs and adult count based on 20 beat tray samples. The same letters above the bars suggest not different. Figure 5. Predatory bugs captured in the 20 beat tray sample per plot. The same letters above the bars suggest not different. Lygus bug (Lygus herperus) (Figure 1), usually a sporadic pest on vegetable crops, is now a major pest of several vegetables this year especially on celery, lettuce, and radicchio in the Salinas Valley. On celery, the feeding injury appears as lesions toward the base of the mature stock and young foliage in the center (Figure 2-3). On lettuce and radicchio, lygus bug feeding injury appears toward the bottom mid-rib area of the leaf (Figures 4-8). Lygus bugs are highly mobile meaning they can move from field to field until they find a resourceful food source. 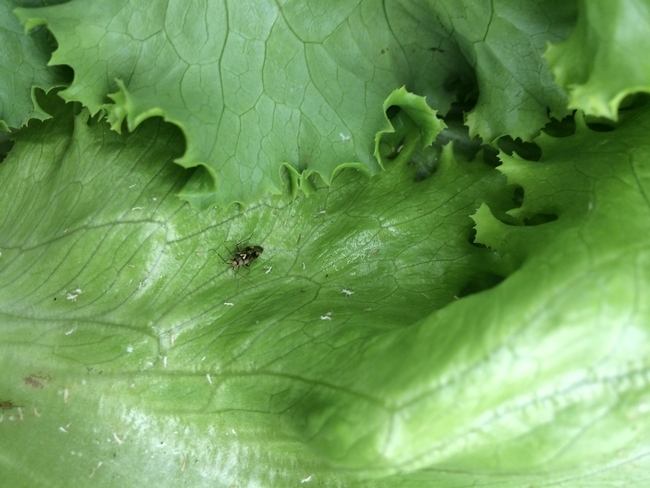 Perhaps, lettuce and celery are not the nutrient rich diet to lygus bugs but these crops could provide much needed moisture and refuge. High populations of lygus bug could develop on weed hosts in the unmanaged areas such as ditches, side of the roadways etc. Also, alfalfa or beans could serve as hosts. When weed plants dry out or mowed, lygus bug adults tend to leave those hosts seeking food and water elsewhere and even seek temporary refuge in the lettuce or celery fields. 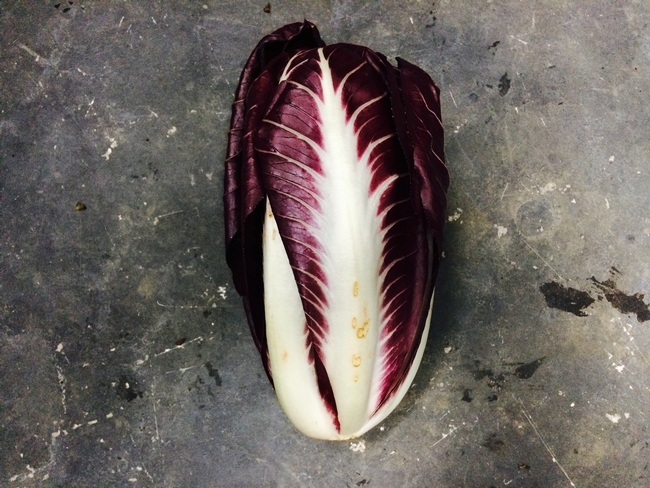 Those female lygus bugs settled in the vegetables not only cause feeding injury but also lay eggs. A lygus bug female can lay on average 150 eggs for its life time in an ideal laboratory conditions. 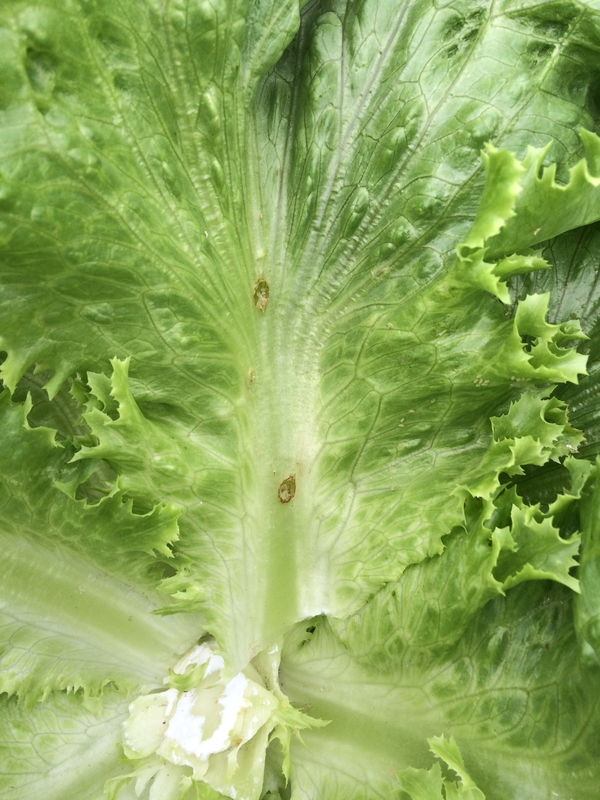 This suggests that a few lygus bug females settled in lettuce or celery can develop into colonies. Any disturbance to the favorable hosts such as mowing the weeds in the unmanaged areas or mass cutting of alfalfa could trigger lygus bug adult movement. It is important that alfalfa growers pay attention when they cut the alfalfa crop. Sequential or staggered alfalfa cutting is advisable because any area wide cutting will disturb them and will cause lygus bug adults flee the alfalfa field. Maintaining the alfalfa crop succulent with adequate water and fertilizer is advisable. Management of lygus bug involves repeated use of insecticides particularly pyrethroid insecticides and Lannate (methomyl). Among those registered insecticides on celery such as Vydate (oxamyl) and Malathion have comparatively longer pre-harvest intervals (PHIs) than pyrethroid insecticides; thus, they are used during the early phase of the plant development. 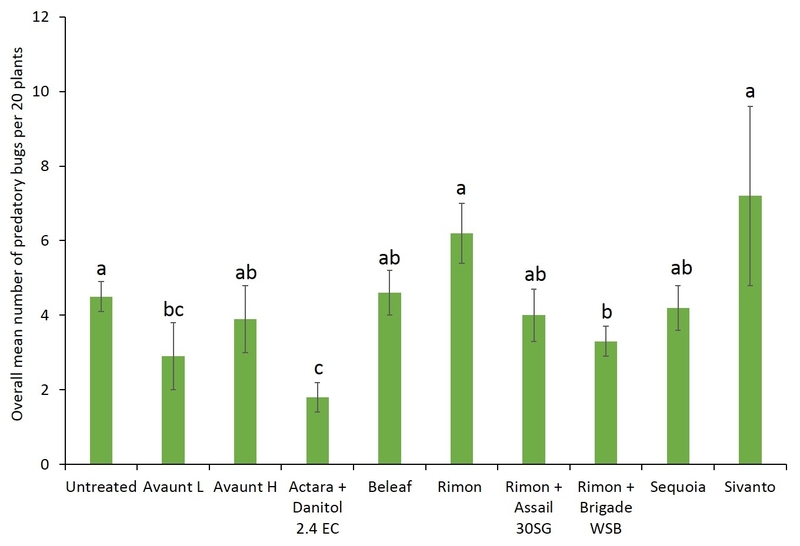 Among the pyrethroid insecticides registered on vegetables, Mustang (zeta-cypermethrin), permethrins and lambda-cyhalothrin (Warrior II) are widely used. Growers restrain from using Mustang because of maximum residue level (MRLs) restrictions imposed by certain export markets. There are several generics of pyrethroid insecticides available in the market. Repeated use or exposing pyrethroid insecticides to same generation of lygus bugs may lead to insecticide resistant lygus bug populations. 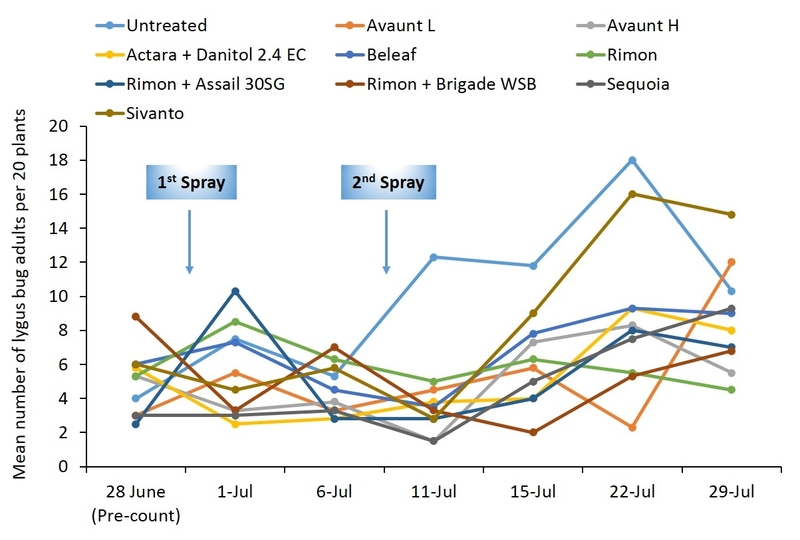 Lack of insecticide coverage could also result in ineffective spray results. As indicated earlier, lygus bug adults are highly mobile and they could move as the spray equipment approaches. If nymphs exist in the field, they could easily hide in the crown areas of the plant. 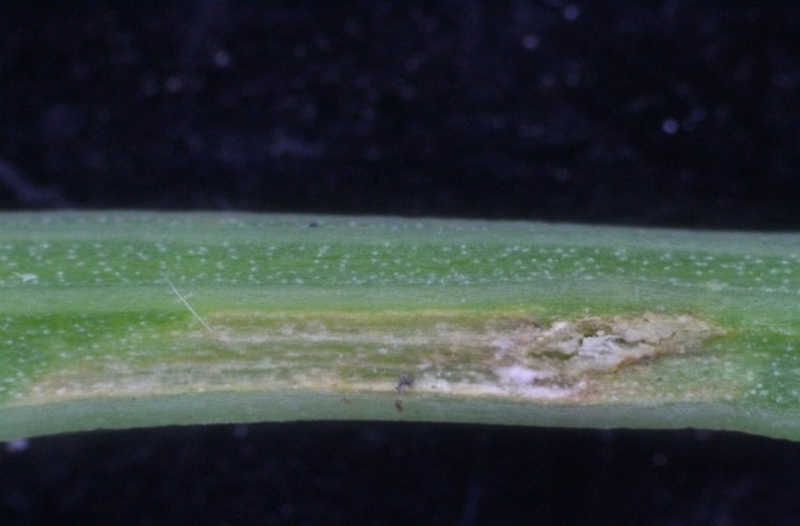 This suggests that there could be several reasons behind inadequate control of lygus bug. Monitoring the field is critical to reduce the establishment of lygus bug colony in the field for timely management.